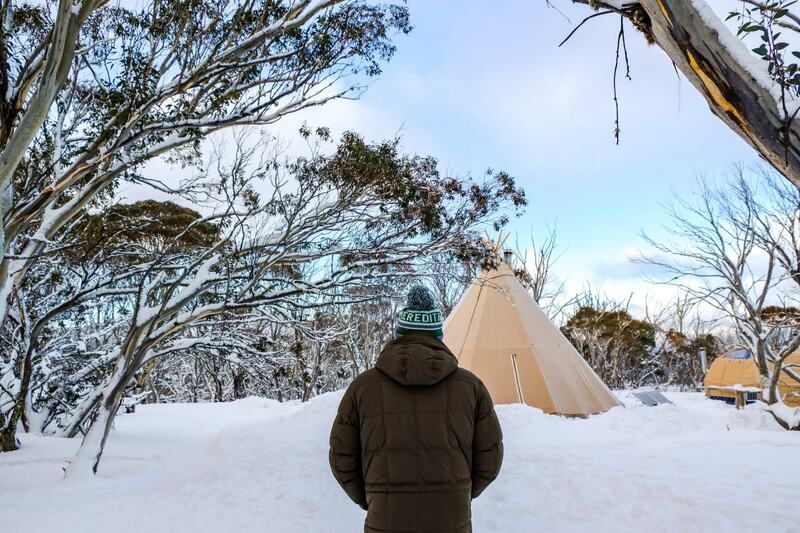 Mount Hotham is Australia’s ultimate winter wonderland. 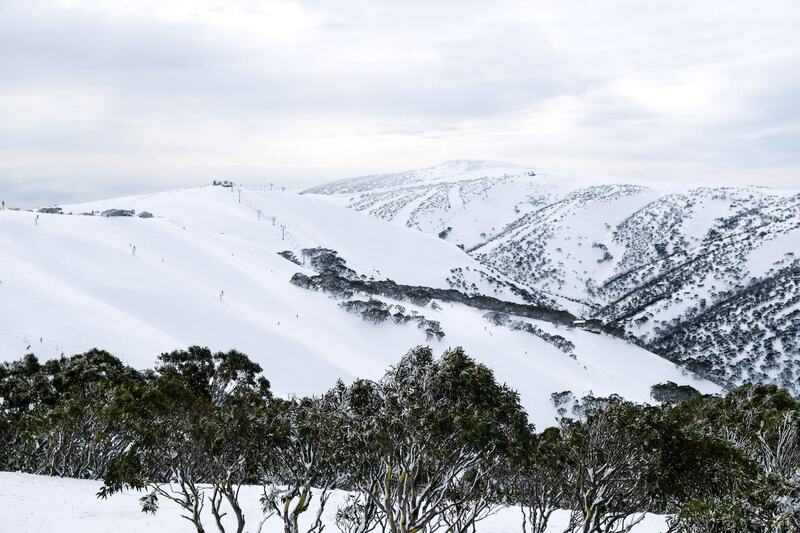 As the highest alpine village in Australia, Hotham boasts tall snowy mountains, stunning views and a huge choice of ski runs to get your adrenaline pumping. 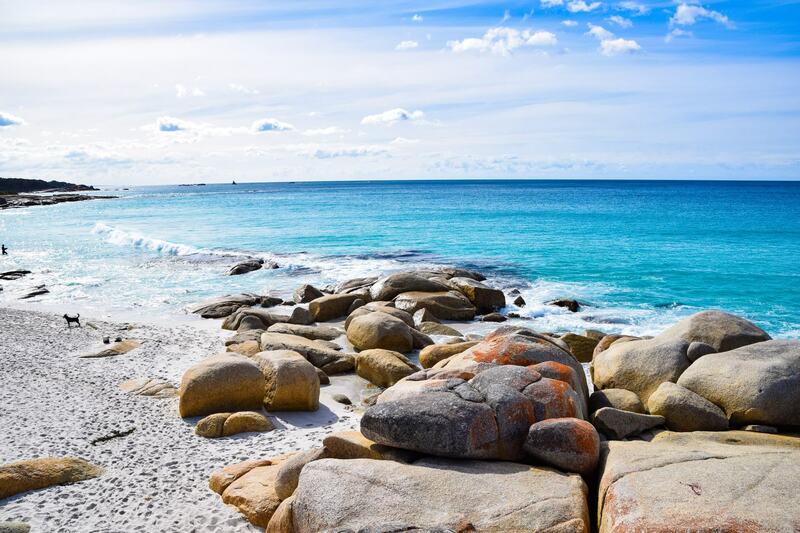 It’s the perfect getaway spot to escape the hustle and bustle of city life and have a winter break. 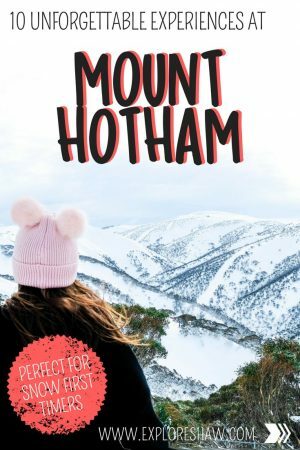 An easy four and a half hour drive from Melbourne, Hotham is the home to some unique and unforgettable experiences that will make your time in the snow even more memorable. 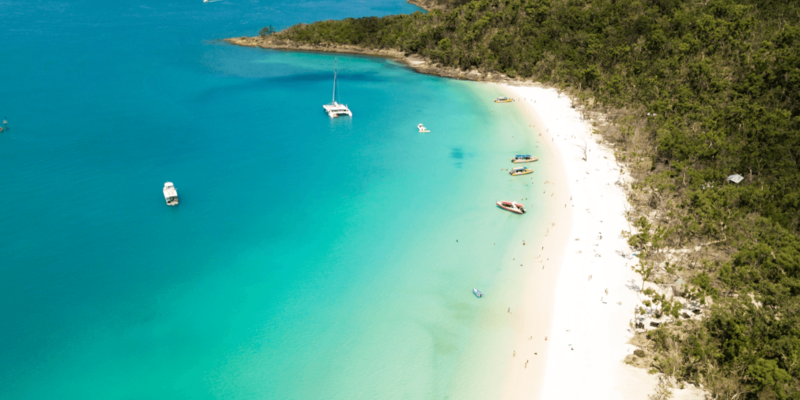 Here’s our guide to some of the best can’t miss experiences. For the ultimate winter wonderland experience, book your accommodation on the top of the mountain. What could be better than opening your curtains to the fresh snow and the view of the mountains right outside your window. 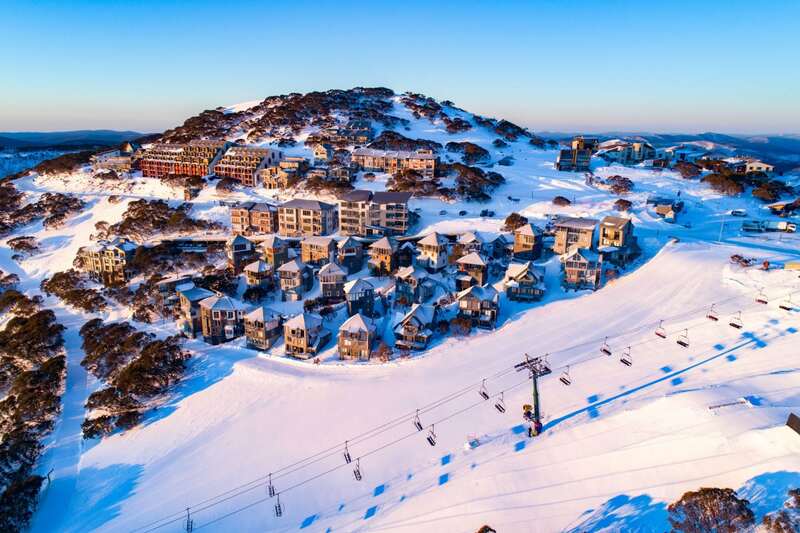 The houses that are located on Mount Hotham are also ski-in-ski-out, which means you can strap your skis or board on at your doorstep and then ski right to the slopes – no need for a car or catching the bus. If you want to get a little out of the hustle and bustle of the village, another great option is to stay at Dinner Plain. Only about a 10 minute drive from Mount Hotham village, Dinner Plain is a little bit quieter, more spread out, but still a beautiful snowy little town. Image from Snow Victoria. If it’s your first time to the snow, this one is a no-brainer. You must book in for a ski or snowboarding lesson with Hotham’s Ski and Ride School before you attempt to hit the slopes. No matter how many kids under five glide past you on their skis, making it look exceptionally easy, don’t be fooled. Skiing and snowboarding can be super hard if you’re trying for the first time and is so much easier to get on top of if you take a lesson. As a snow newbie, I booked us a snowboarding lesson with the team at Mount Hotham – convincing Thom to try boarding with me as well. He skiied a lot when he was at school, but he had never been snowboarding either. He was a natural though, of course! The lessons at Hotham are fantastic. They last for two and a half hours with an expert instructor and are in small groups of less than 7 people, so you have lots of one on one time with your instructor and the chance for heaps of practice before you hit the slopes for the first time. 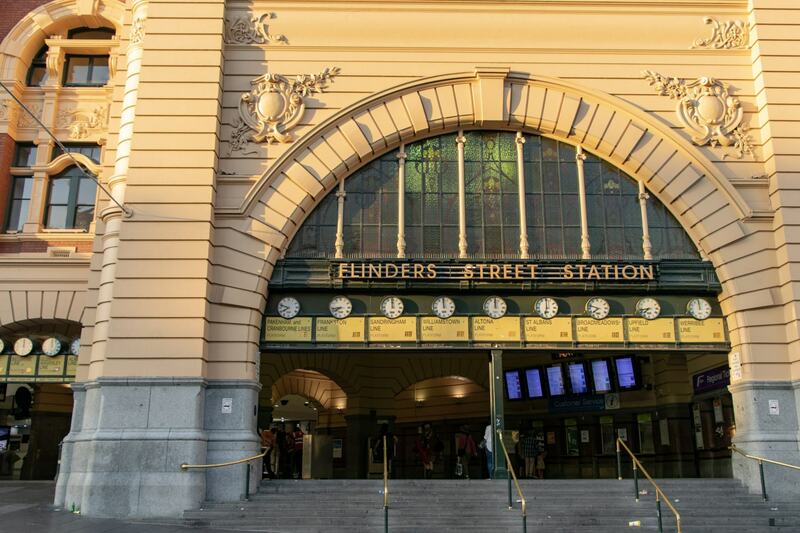 Location: Meet out the front of the middle entrance of Hotham Central. Lessons are divided into four levels from beginner to advanced, so make sure you check your ability level to see which colour zone you should be in. Price: Receive a 10% discount on your group lesson when you book online in advance HERE. One lesson costs $69 AUD per person (or $77 AUD if you buy over the counter on the day). Lesson times: Group lessons run daily from 10am and are available for all zone abilities. A second group lesson session runs at 1pm each day, just for beginners. Important info: A lift pass is required for all group lessons ans is not included in the lesson price. Lift passes start from $138 AUD per adult for a one day pass. 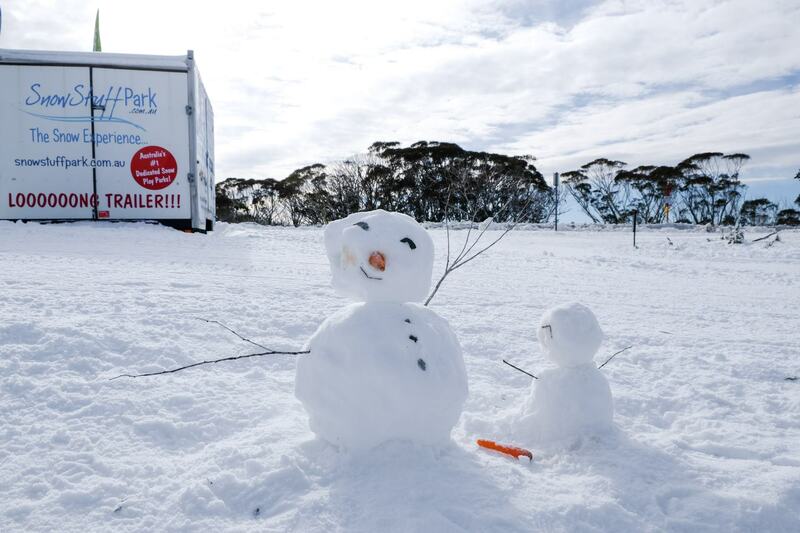 Find out more about Hotham’s lift passes and deals HERE. Find out more: You can find out more about Mount Hotham’s adult group lessons HERE. Kids lessons and private lessons are also available. For the most fun in the snow you can’t go past SnowStuffPark. It’s fun for the whole family and everyone who’s secretly a child at heart (that’s me!). SnowStuffPark offers scenic snowmobile rides across the mountains, with all sorts of duration’s starting from 10 minutes to half day tours, as well as toboggan hire, petrol powered snowboards and kiddie snowmobiles to hire. 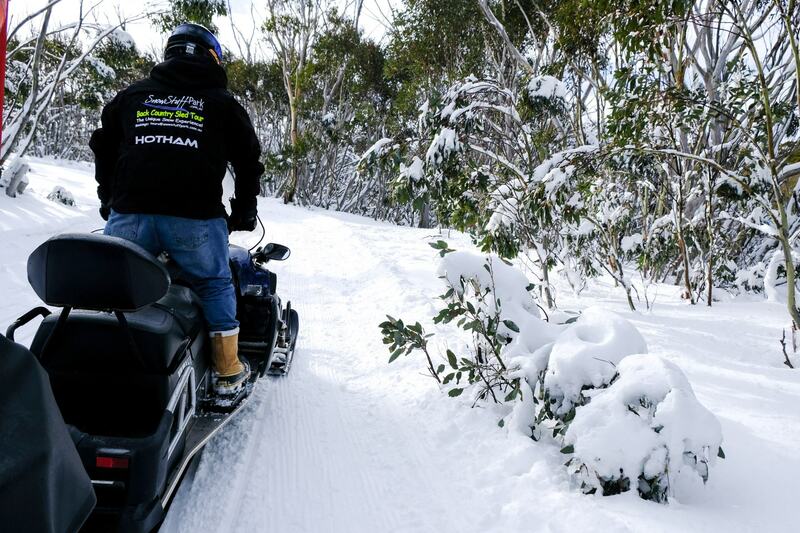 The snowmobile’s can fit 4 people, so it’s a great way to see more of the Hotham Hills if you’re travelling with a group. The most popular snowmobile option is the 30 minute back country sled tour which takes you across Wire Plain, Davenport and Slatey Cutting Area, with some new terrain opening up near Whisky Flat as well. Location: You can find the SnowStuffPark office at Wite Plain, right next to bus stop number 12. There’s also a car park right next to the snow park if you’re travelling by car. Price: The tour costs $170 AUD for 2 people or $260 AUD for 4 people, as always tours are subject to weather and snow. Important info: The winter air can get super chilly when your dashing around on a snowmobile, so make sure you’re all rugged up, with a beanie, waterproof jacket and footwear, and of course – your camera! Find out more: Find out more and book your snowmobile ride at the SnowStuffPark website HERE. 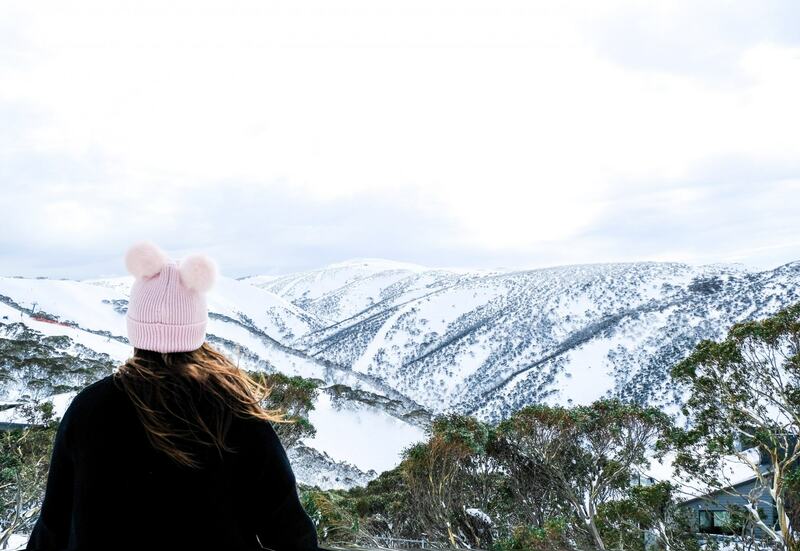 For one of the most unbelievable experiences you can have at Mount Hotham, make sure you check out Alpine Nature Experience. They have a few different experiences to give you the ultimate snow experience. Take a scenic snowshoe walk through the snow to Alpine Nature Experience’s stunning little eco-village and experience an evening of mulled wine and a 3 course dinner made up of French cheese fondue. After dinner it’s a short snowshoe walk back to Wire Plain, where you will have a beautiful view of the stars and night sky. Tickets cost $109 AUD per person for the Snowshoe to Fondue experience, and can be booked directly on the Alpine Nature Experience website. NEW FOR 2018! Maximise your experience by staying overnight in your very own private snow dome, where you can watch the stars right from your comfy cosy bed as your in-tent wood fire keeps you warm and toasty. In the morning you’ll also be treated to a ski-mobile ride in the morning, offering you views over the mountains and surrounding valleys of the Alpine region. The Igloo to Skidoo experience must be booked in conjunction with the Snowshoe to Fondue experience and costs an additional $180 AUD per person. If you can’t commit to a full night of nature you can also choose to experience just the snowshoe walk to the eco-village. You’ll also be treated to a glass of mulled wine in the evening before snowshoe walking back up to Wire Plain. To experience the snowshoe tour only costs $35 AUD per person. Experience the mountains like never before, with Mount Hotham’s night skiing and snowboarding sessions! Each Saturday and Wednesday you can ride under the stars at the Big D and Dinner Plain throughout the snow season. When: Wednesdays and Saturday nights throughout the snow season, from 6:30pm to 9:30pm. Price: Tickets are $15 AUD per person. Children under 5 and seniors over 70 years old can ski for free. Grab your tickets from all ticket outlets on Hotham, as well as at the Big D office which is open during the night sessions. 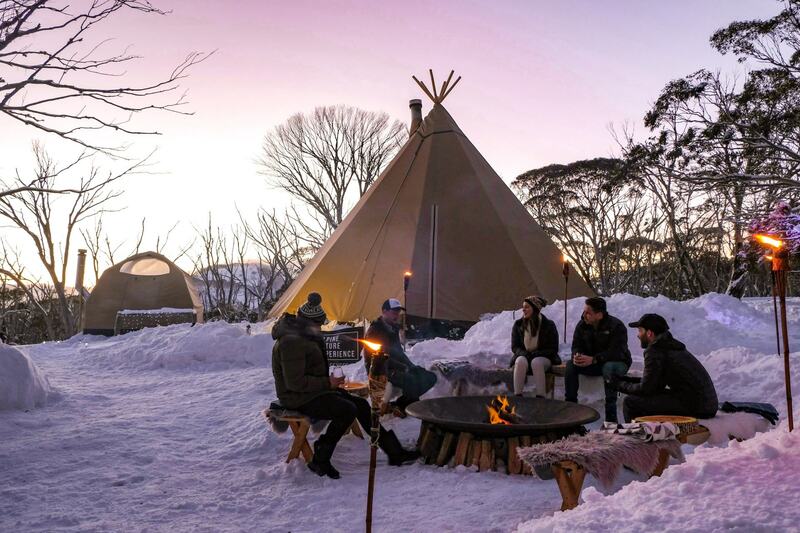 When: More of a twilight experience, you can ride during the twilight at Dinner Plain on Wednesdays and Saturday nights throughout the snow season, from 4pm to 6:30pm. Price: Tickets are $12 AUD per person. Children under 5 and seniors over 70 years old can ski for free. Grab your tickets from all ticket outlets on Hotham, as well as at the ticket hut at Dinner Plain Snow Park which is open during the night sessions. Find out more: Night sessions in both locations are subject to weather conditions. Make sure you check out the Mount Hotham Lift & Terrain Report to check the conditions before you buy your tickets. Hotham has an endless amount of beautiful mountain views for you to check out. I can’t even tell you how many times I asked Thom to pull the car over so we could check out a view or take more pictures. Make sure you take the time to really appreciate the beauty of the alpine region and experience the views from every angle. 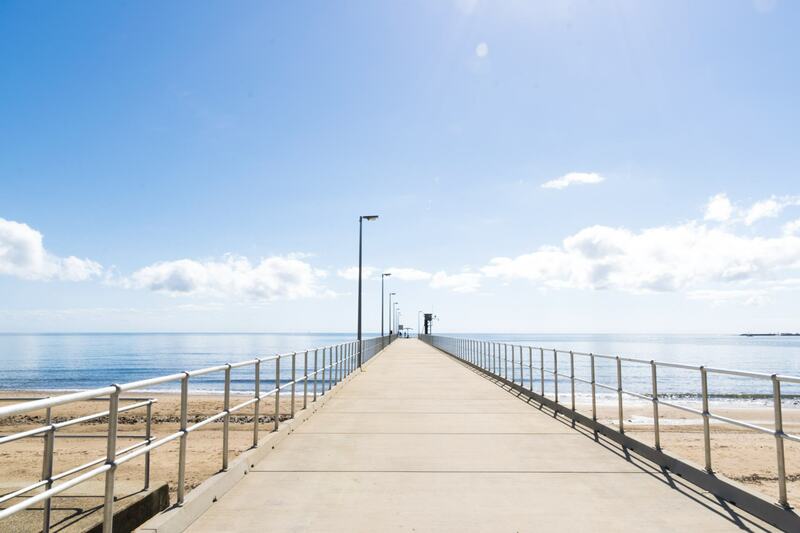 Some of them can be particularly cold and windy when you get out of the car, so make sure you’re rugged up with a beanie and big coat so you can appreciate where you are without freezing! 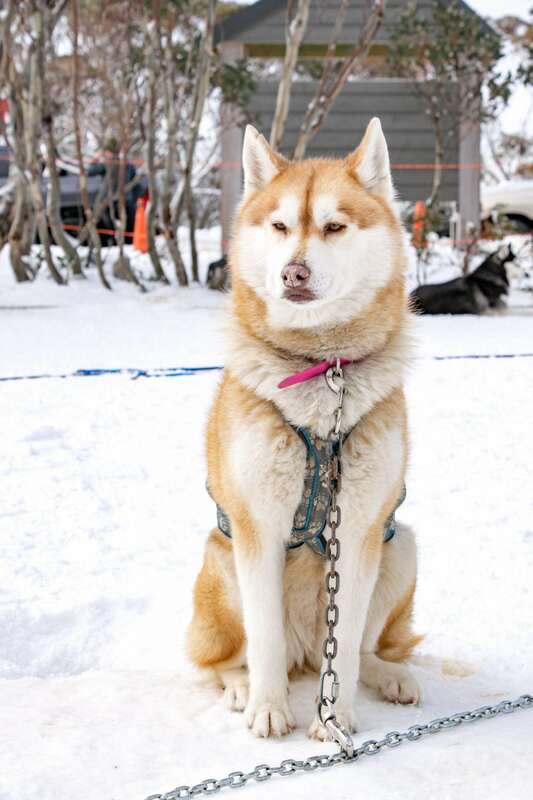 Slide through the snowy back-country trails in your own little sled, run by a team of beautiful Siberian Huskies. Location: Howling Husky can be found behind the Wire Plain Hut. You can either park in the Wire Plain carpark if you’re travelling by car, or jump off the bus at stop number 11. There are a few different options for your husky ride through the snow. Remember, rides book out quickly, so pre-bookings are essential for husky rides. There are three different tour options for your husky sled experience. 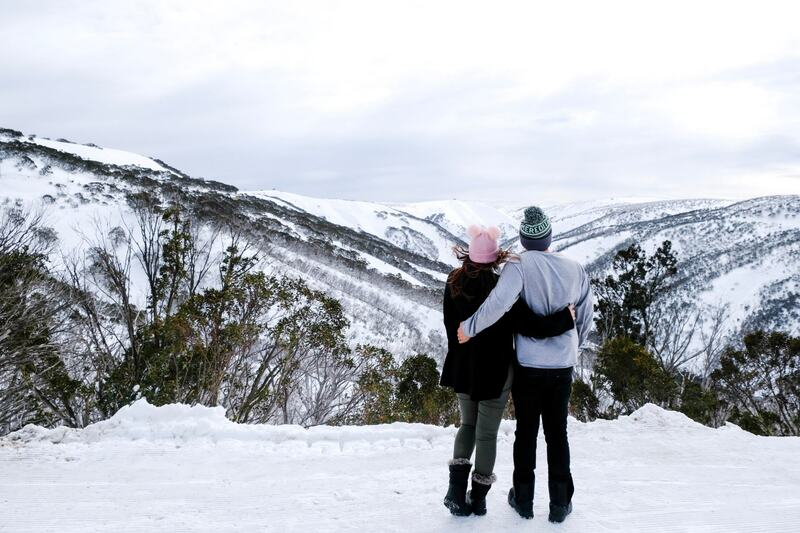 All tours include an exhilarating tour through the snow and over the Hotham Hills. 15 minutes at the end of each tour is also set aside for ‘Pat n Play’, where you can shower these cute little huskies with hugs, kisses, pats and selfies to remember your ride. Polar Paws Express: An introduction to dogsled riding, Polar Paws Express lasts for 45 minutes (including 15 minutes at the end for Pat n Play), and costs $300 AUD for 2 people riding together. Stumpy Tailed Trail: Experience even more of the huskies ride, across the loopy looped trails of Mount Hotham. 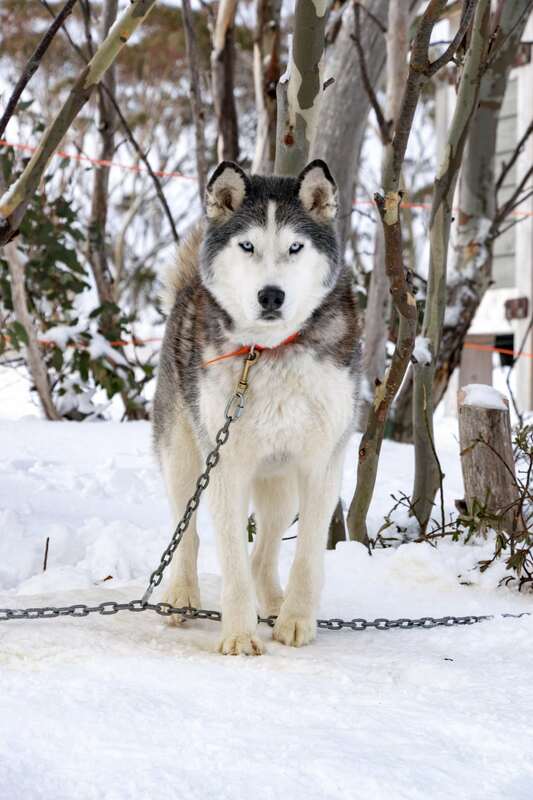 Learn more about the dogs, their jobs, the commands that your musher uses, the history of the sport of dog-sledding and the unbreakable bond between people and their dogs. On the Stumpy Tailed Trail the musher will even let you have a go of driving if you’re feeling brave! This tour lasts for 1.5 hours (including 15 minutes at the end for Pat n Play) and costs $500 AUD for two people riding together. 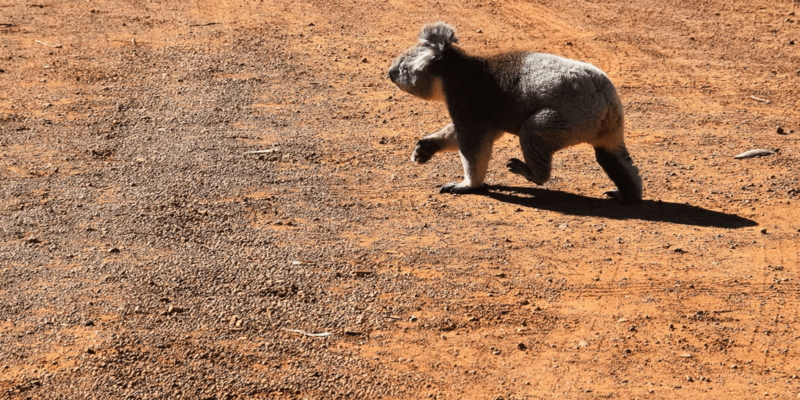 Possum Path: With all the same features as Stumpy Tailed Trail, this option is for families and costs $550 AUD for 2 adults and 2 children (children under 3 are free). Important info: There is a weight limit of 160kgs per 2 people riding in the sled. Find out more about the Howling Husky tours and book your ride HERE. 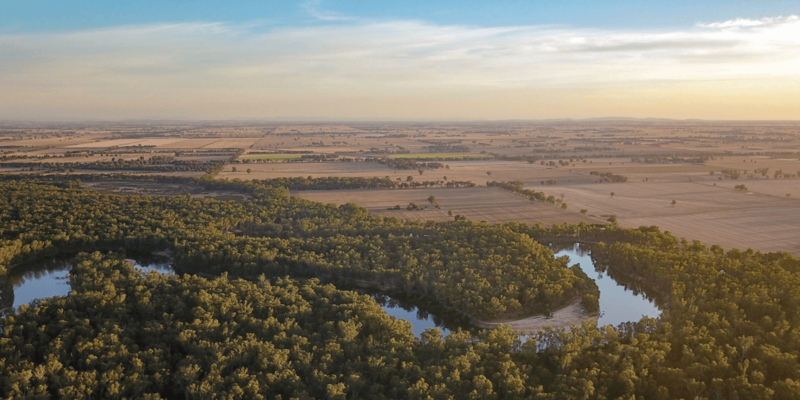 One of the most scenic drives in Victoria, the Great Alpine Road stretches from Wangaratta over the mountains and Hotham Heights and down to Omeo on the other side. 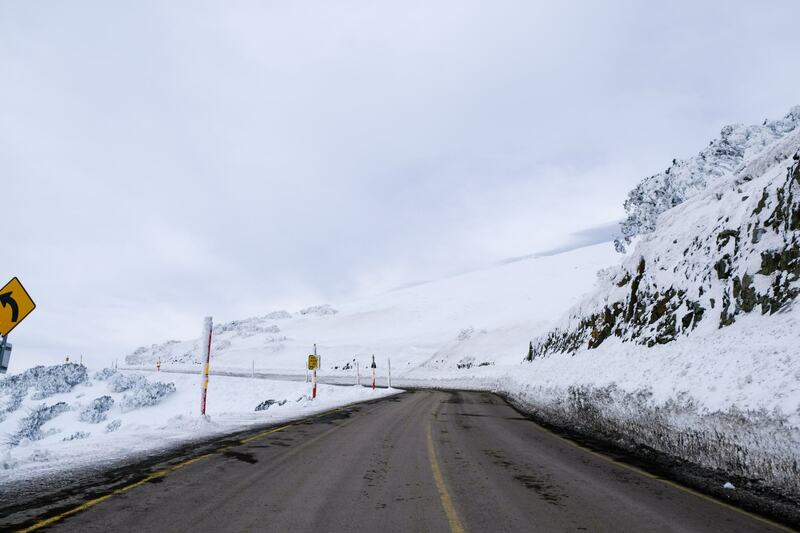 This windy road offers you some beautiful views of the mountain tops, snow covered trees and just all round epic views as you make your way to the alpine village right at the very top. As you start the drive from around Harrietville at the bottom of the mountain it’s almost like a forest drive, and then slowly there starts to be a little bit of snow on the roadside, and then a little bit more, until before you know it you’re completely immersed in the snow. Because every first timer to the snow needs to build a snowman right?! Head down to the play park at Wire Plain, right next to bus stop 12, where you can get busy in the snow making snowmen, snowangels and anything you can think of. 10. Shop til you drop and eat til you pop! For anyone still not convinced that the snow is for them, you can spend the day just shop hopping and eating your way through Hotham until you’re completely full! Hotham village offers lots of shopping options for anyone who prefers not to ski, from luxury clothing to Hotham merchandise. You can also find all sorts of pubs, cafes and restaurants around the mountain to keep your taste buds excited all day long. 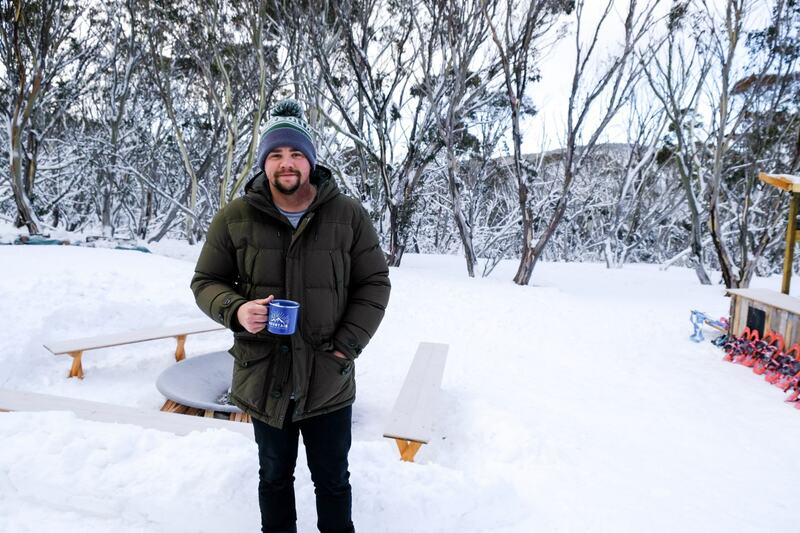 For everything you might need to know about a snow trip out to Mount Hotham, make sure you check out the Mount Hotham website.